SharePoint pages are a great way to share ideas using images, video, links, documents and more. SharePoint lists are a great way to collaborate on data. 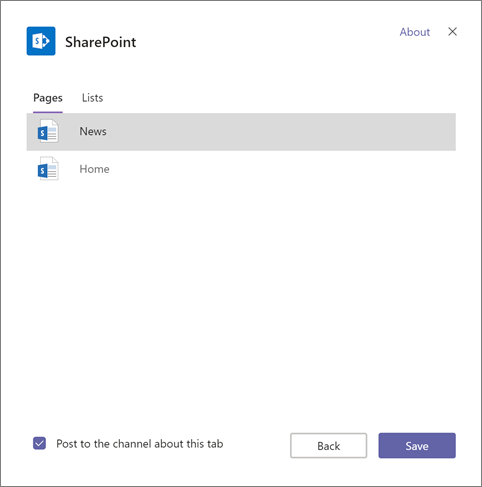 If you are using Microsoft Teams, you can add a published page or a list to a tab in a Teams channel. Your team members can edit lists. They can view pages and add comments in Teams. However, they can only edit the page on the team site. Note: You can only add tabs to teams that have enabled team members to do so. If you can't add a tab, then talk to your team owner. In Teams, select + on the tab bar. Select the list, page, or news post to show on the tab. Make sure the checkbox for Post to the channel about this tab is selected if you want to let your team know in a post that you've added this tab. Otherwise, clear it. Note: You can select only one page or list per tab. You can repeat this procedure to add more tabs for more pages and lists.